For questions about SHAC Venturing Officers Association (VOA), send an email to shacventurer@gmail.com. Vice President of Program Caroline K.
Vice President of Administration Georgie H.
Vice President of Communications Monique C.
Ariana has been a champion of Venturing from her Crew’s founding in the Spring of 2016. Ariana has held various leadership positions within her Crew including VP Administration, VP Program, and President. 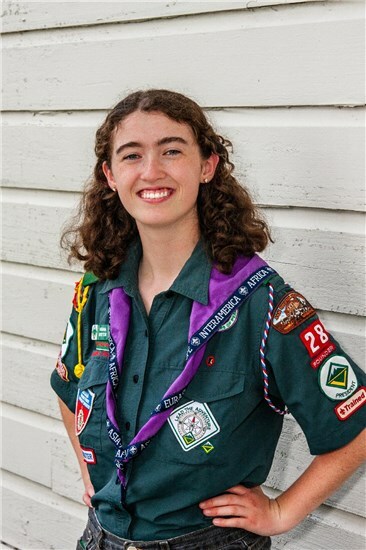 She has progressed through the Venturing awards and currently holds the Pathfinder award and is working on her Summit Project. Ariana has attended all the Crew level training required for the awards and has attended NYLT and staffed it multiple times. She has... also participated at NAYLE in 2017 and staffed NAYLE summer 2018 at Philmont. Ariana is also Wilderness First Aid Certified and a Leave No Trace Trainer. She is an advocate for youth leadership which she demonstrated most recently while planning and running the 2018 Venturing Challenge. Her leadership skills will again be tested in February of 2019 as she assists in the establishment of Troop 82. Ariana’s love and passion for nature and adventure have led her to her future career as a Ranger at our Nation’s Parks and Lands. Ariana’s commitment to the ideals of not only Venturing and not just the BSA, but to the Worldwide Scouting Movement is ever present in every facet of her life and interactions with adult and youth alike. Georgie loves Scouting!!! He is currently a Life Scout in Troop 609, Apprentice in Ship 1701 and working towards Discovery in Crew 222. 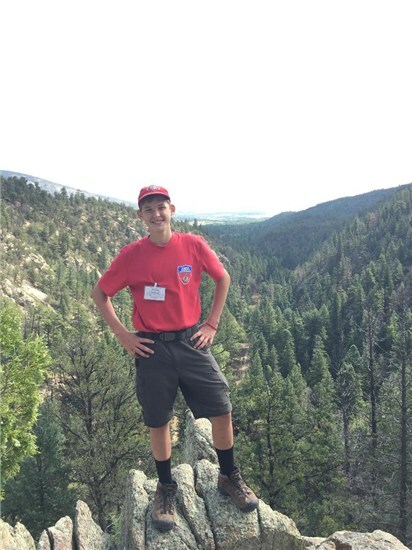 He has attended and staffed NYLT, just completed NAYLE at Philmont this summer and attended S.A.L.T. at Summit and took part in Venture Extreme at Lost Pines Scout Ranch. Georgie also enjoyed staffing Winter Camp 2017, and is looking forward to the Kodiak Challenge for Venturing that is being discussed for Winter Camp 2018! Georgie is entering his Sophomore year in High School, but has the most fun making friends and hanging out with Scouts from all over SHAC. Hi, my name is Caroline, the current secretary of Crew 62. I was the founding president of my crew and couldn't be prouder of how far it has come. I am currently a Pathfinder working towards Summit. I have both staffed and attended NYLT and Powderhorn, and I hope to staff both of them again. In 2017 I earned the Iron Horse District Venture Scout of the Year award. I am also an LNT trainer and have completed ILSC. Outside of scouts I am enrolled in the International Baccalaureate program and I am heavily involved in Theatre. Last year I was your Vice President of Administration. I hope to continue to serve SHAC Venture This upcoming year. Monique currently serves as the Crew President for Crew 355. Under her leadership, we have improved communication and increase our numbers and activities. She has encouraged any interested venturers to complete rank requirements by planning and providing training while also instigating spontaneous outings, like night at the movies. She is very organized and is active in marching band, mu alpha theta (math club), and National Honor Society at Spring High School. She completed lifeguard and emergency medical responder training with Crew 911. Her enthusiasm carries into all she does.